Tagline: A man went looking for America and couldn't find it anywhere! The Story: In Easy rider a counterculture film, we have a spaced-out trio of Peter Fonda, Dennis Hopper, and a funny Jack Nicholson tooling down the "high"way, on motorcycles and "stuff", en route from L.A. to Mardi Gras. As artistic expression during an angry era of war and social change, the film communicates a powerful philosophy, in lieu of a complex plot. Most scenes in Easy rider take place outdoors, in the American South and Southwest. Laszlo Kovacs' adroit cinematography, combined with an expansive soundtrack, hippie lingo, and "cool" clothes, convey the film's underlying message of individual freedom and nonconformity. The film is significant in that it was one of several successful 60's films made by individuals outside the traditional Hollywood studio structure. 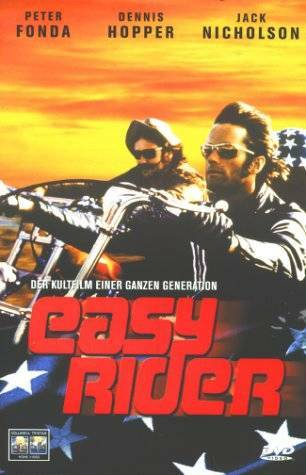 As such, "Easy Rider" broke new ground in film-making.